Most Cichlids come from Africa and South and Central America, with a few species found in Asia and North America. 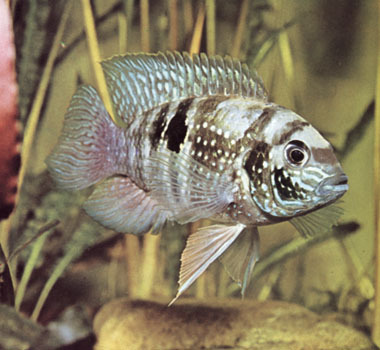 Cichlids inhabit the most varied of waters, ranging from roaring rivers to the smallest of ponds. 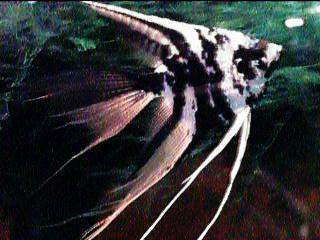 the Angelfish One sign that the Cichlids are part of the order Perciformes is their Dorsal fin. It is made up of two parts, one with soft rays, the other hard spiny rays. The various species differ from each other mostly in body shape and the shape of the mouth and teeth. Body shapes vary from pencil like to leaf shaped. The most common shape found in the Cichlids is a fairly arched back, end positioned mouth and flattened sides. The shape of the jaw is either overshot or undershot. In the Cichlid tank there must be places of refuge. These can be rock caves, large pieces of drift-wood or even inverted flowerpots. Most large species of Cichlids will dig up the substrate material, so it is best not to have plants included in the aquarium decorations. The Angelfish, Discus and the dwarf species Apistogramma all prefer a densely planted tank. The water temperature should be in the range ot the middle seventies, slightly higher for the Discus. The diet should consist of live and frozen food of all kinds as well a large flake staple food. Large specimens can be feed Earth-worms, garden Crickets and kitchen leftovers. 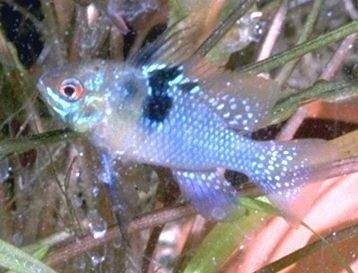 Some species like Geophagus need their diet supplemented with plant material. Ram Cichlids have highly developed brood care patterns and are very territorial, therefore aggressive behavior plays an important role in their lives. You must be prepared to deal with this. After mating a pair will usually break up and the female will be driven away by the male. If there is not enough cover the female may be killed. Do to their aggressive behavior the Cichlids should be housed only with large fish that can hold their own against them, large Barbs and Catfish can sometimes be tolerated. Keeping a single specimen in a large aggressive community tank can work out fine also. If the tank inhabitants are selected with the character traits of the Cichlids in mind, these fish can be kept in a community aquarium. Dwarf Cichlids get along well with the Characins and other schooling fish. Pairs of different Dwarf Cichlids can be housed together in larger tanks as long as there is enough space for them to claim their own niche or small territory. Large Cichlids get along with large fish of various species and generally should be kept with fish of the same temperament and size as themselves. There are a few large species that are peaceful and can get along in a normal community set up, but remember even if they are peaceful their nature will not allow them to pass up a meal of any small fish they can catch. 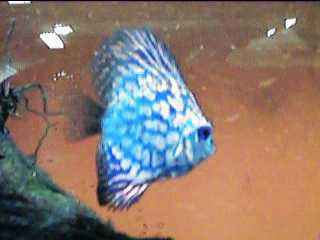 Check with your local pet store for details on any Cichlid before you buy it. 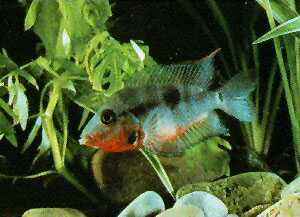 Cichlids are divided into mouthbrooders and substrate brooders. Substrate brooders lay their eggs either openly on a surface ( open water brooders ) or hidden in cavities (Cavity brooders ). Both groups engage in brood care. The eggs are fanned to help increase the Oxygen supply. the Hatched Larvae are looked after until the contents of the Yolk-sac is used up and the young are free swimming and eating on their own. Parental care continues even beyond this point, mostly in the form of protection against predators. This is the time that is most dangerous for other tank inhabitants as the parents increase their territories and become more aggressive toward the other tank dwellers. Mouthbrooders pick up their eggs and their larvae in their mouths, either right after or during spawning. This group is called "Ovophile" ( egg loving ) mouthbrooders. some mouthbrooders deposit their eggs on the substrate where they look after them until the Larvae hatch. Then they pick the Larvae and keep them in their mouth until they are free swimming. This group is called "Larvophile" ( Larva-loving ) Mouthbrooders. In many species parental care stops when the Fry are first released from the mouth, but in some the care continues with the young being able to swim back into the the parents mouth for protection when danger arises.